DC Universe Presents Vol. 2: Vandal Savage feels more relevant than the first volume, and overall sharper writing makes it a better read. There's a lot of content here, though some will be reprints for DC Comics readers who play the field; also the illusion of relevancy doesn't necessarily promise relevancy itself, which may be DC Universe Presents's biggest disadvantage. The second volume of the New 52 anthology series includes DC Universe Presents #9-12 (James Robinson and Bernard Chang's three-part Vandal Savage story, plus a Kid Flash story by Fabian Nicieza) plus two related Kid Flash back-up stories from Teen Titans, and the DC Universe Presents #0 Zero Month issue. Five-and-a-piece issues is a small trade, relatively, despite that the multiple origin stories in the Zero Month issue might make the book feel longer. At the same time, all the Teen Titans material is also reprinted in Teen Titans Vol. 2: The Culling, and the Mr. Terrific short story from the zero issue is reprinted in Earth 2 Vol. 2: Tower of Fate, so there was a considerable part of the material that I, having read those two other trades, simply skipped. Still, I have tried to be a good sport about the "new" in the New 52, I like Robinson's writing, and generally I liked his three-part Vandal Savage story. 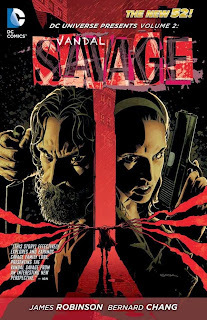 In positing Kass Sage as an FBI agent and Savage as an imprisoned serial killer (if also immortal caveman) who helps the FBI catch a copy-cat, Robinson knowingly evokes a Silence of the Lambs aesthetic, and this is a fun dynamic to see set in the DC Universe, especially with the added drama of Savage and Sage being father and daughter. The first chapter is specifically the best, and where the Hannibal Lecter vibe is the strongest, as Savage and Sage trade barbs between the walls of a prison cell. I thought Robinson stepped on the story a bit, however, at the point in which they revealed the metahuman culprit. Savage is, of course, more than human, but not in an overt way, such that a murder mystery plot with Savage and Sage comes off as mostly "realistic" (as Hannibal Lecter's adventures are mostly "realistic" even as Lecter's abilities seem sometimes preternatural); but when Robinson reveals the actual killer, drawn by Chang to look a bit like a wizened Scooby-Doo bad guy, the story becomes more fanciful than I'd have liked. The story is appropriately suspenseful and bloody, another selling point (Hannibal Season 2 can't get here soon enough) but in all I didn't think Chang's work was quite as atmospheric as the story required. Ultimately I enjoyed the premise and set-up of Robinson's story, and I wouldn't mind reading about the further adventures of Kass Sage, though with Robinson's departure from DC Comics it seems less and less likely Kass Sage will ever make the page again. This is unfortunate, and it also points out a significant difficulty with this volume of DC Universe Presents. All the stories here seem to have potential to continue elsewhere; the Vandal Savage story, for one, but also the Zero Month origin stories -- Hawk and Dove, the Blackhawks, and OMAC, among others -- but of them, probably the Mr. Terrific story is the only one that will. As an anthology, it is DC Universe Presents's job to tease storylines that, were they to catch on, could continue in other books, but as few of these have caught on (and DC Universe Presents is now cancelled), few of them ever will. The Zero Month origin stories are, in their own right, also good. The OMAC tale gives us one more shot of Keith Giffen's faux-Kirby art, plus suggests a connection between Brother Eye and Batman. The Hawk and Dove story actually answers a question left unresolved at the end of Sterling Gates and Rob Liefeld's Hawk and Dove series, namely what the connection was between Doves Don Hall and Dawn Granger; the Blackhawk story resolves how Lady Blackhawk lost her eye. The difficulty is that each of these stories (with the exception of the Deadman short) suggests it will continue on elsewhere, but likely never will. I do appreciate that DC gave each of these cancelled series the opportunity to tell one last story (suggesting, perhaps, that there will always be a place for your favorite characters in the New 52, somewhere, someday), but it's unfortunate that the stories raise more questions instead of bringing the series to a fuller close. It remains to be seen, therefore, whether DC's new Secret Origins series that effectively replaces DC Universe Presents will be a pleasure or an annoyance. Will it, like the Presents Zero Month issue, propose storylines that won't go anywhere? Will it be a vehicle for creators to retcon origins established by earlier teams (will Greg Pak revise Scott Lobdell's Superman origin, or will Tony Bedard revise Michael Green and Mike Johnson's Supergirl origin), fracturing New 52 continuity in the way that the pre-Flashpoint continuity eventually fractured? Or can DC keep consistency among the Secret Origins stories such to give us new insights into the characters that we didn't have before? I think the answers to these questions will largely determine how long Secret Origins lasts or if it eventually goes the way of DC Universe Presents. DC Universe Presents Vol. 2: Vandal Savage is a satisfactory read, especially for fans of James Robinson or one of the cancelled series that bows out here. But I referred the other day to Sword of Sorcery: Amethyst as a good, long book to take on a plane ride; Presents Vol. 2 is just the opposite, a quick read that offers more a taste of what could have been than a meal unto itself. We follow Superman to H'el again, later this week.